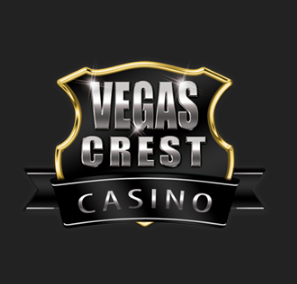 Vegas Crest casino is part of the Vista Gaming group of online casinos. This company has been in business since 1996 and has a big number of online casinos in its ranks. The casino itself was launched in 2014 and they have a big number of loyal players. When you create your account at the casino you can choose to play in EUR, GBP and USD. You can also make deposits and withdrawals by using Bitcoins, which just shows that Vegas Crest is a modern operator. 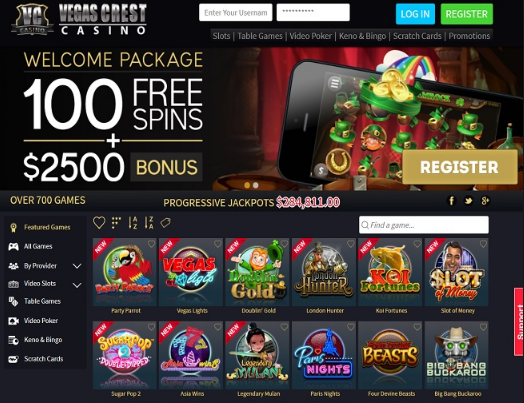 When it comes to casino games Vegas Crest has a diverse offer. Players can enjoy a big number of video slots, table games, keno, scratch cards, bingo and video poker. Unfortunately the casino doesn’t offer any live dealer games at the moment. The casino is powered by a number of reputable software providers, including: Betsoft Gaming, Booming Games, Concept Gaming, Endorphina, GameArt, Habanero, Mobilots, Rival gaming, Saucify and their very own Vista Gaming. This way players can choose among a big offer of casino games. The bonus promotions at Vegas Crest casino are very attractive. Once you create your player account at the casino you will instantly receive 10 no deposit free spins on the video slot The Tipsy Tourist. Once you decide to start playing for real money at the casino you can claim a 200% up to $1,000 on your first deposit. The casino will also throw in 30 free spins on their video slot Pinocchio. On your second deposit at the casino you can claim an even bigger bonus of 300% up to $1,500. In addition you will also get another 60 free spins on the video slot Fruit Zen. As you can see their welcome bonus offer is quite generous. But the bonus offers don’t stop there. You can claim a 200% bonus on your first deposit of the day, every day. You can also claim a number of other bonus promotions, as well as get no deposit rewards for being a loyal player at the casino. Players at Vegas Crest can make deposits by using American Express, Cheque, MasterCard, Money Transfer, Neteller, Visa Electron, Visa, Skrill, Direct Bank Transfer, Bitcoin and Use My Services. All withdrawals at the casino have a 48-72 hours pending period and withdrawals to e-wallets are processed within 48 hours after the withdrawal is approved. For any questions you can contact the casino support team which is available 24/7.